Vahap Usta pulled a pair of reading glasses from the inside pocket of a snug dinner jacket and sifted through a stack of newspaper clippings. 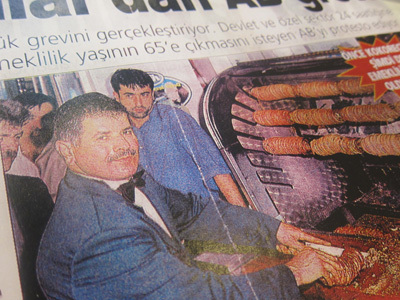 Here was a full spread from a major daily paper proclaiming him the “King of Kokoreç” and another with him in his signature tuxedo and bowtie in front of his stand in the central Sirkeci district. The horizontal rack of javelin-length skewers loaded with tightly wound lamb intestines sagged in the middle from the weight. His stand, a hulking stainless steel cart, was so gleaming it resembled a Streamline trailer. Another article reported on his protest of Turkey’s EU accession bid because of a clause that would forbid kokoreç for sanitary reasons. The “bow-tied businessman of Sirkeci,” as he was called in yet another article, was more than a great photo opportunity; he was a prosperous businessman and a true Istanbul character whose trajectory reflected the hopes of many who still come to make it in this city. A migrant from Malatya in Eastern Turkey who hustled tea near the Egyptian Bazaar as a boy, he lorded by the mid-1990s over an empire of kokoreç stands – 33 at its peak – walked his own production floor, drove a white Mercedes (“when that model was in style,” Vahap Usta pointed out) and counted more than 50 tuxedos in his closet. Beyond the financial gain, though, Vahap Usta was a cult figure – the Willy Wonka of kokoreç – who helped make this street food iconic. And then he disappeared. “Vahap Usta is like a kite without a string. You never know where he will end up,” said Vahap’s old neighbor, optician Bilgin Bilgic, to the Akşam Newspaper in 2003. The legend of Vahap Usta lives on in Facebook pages (“Vahap Usta Neredesin?/Where are you Vahap Usta?” asks one) and through claims of recent sightings and nostalgic blog posts of encounters long past. But for quite a while no one seemed to know what exactly happened to the kokoreç King himself. Our attention was brought to this story by friend and fellow trencherman Salih Abi, author of the great food blog Harbi Yiyorum. 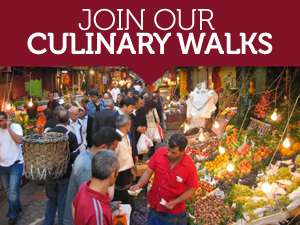 We followed false leads for a year before we finally found Vahap Usta, working at his kokoreç counter on a commercial strip in the Şişli neighborhood. So what happened to Vahap Usta? He sighed and removed his reading glasses, which, we noticed, were missing one arm. “Nobody can lose money the way I can. It is an art form,” he said, flashing a grin. Though he says that he was the first to grill long thick rolls of kokoreç over coals as a street food, we’ve found evidence to the contrary. And there is no way to verify the claim that he sold around 12,000 kokoreç sandwiches and a truckful of ayran every day from his cart, because, like many things about Vahap Usta, his books are not available for review. But we do know that Vahap Usta’s boom coincided with a wave of kokoreç popularity, when its image transformed from a somewhat obscure street food into a staple of Turkish pop culture. At the time, conflict in Eastern Turkey raged; Turgut Özal, then prime minister of Turkey, was selling state assets like hot potatoes; and Istanbul’s population doubled (again). As Turkey’s largest city and economic powerhouse, Istanbul was rapidly modernizing and experienced serious growing pains. Fortunes were made and lost along the way. 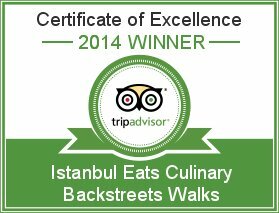 On the streets of Istanbul, meanwhile, a revolution was taking place, with the business principles of Western fast food meeting the flavors of traditional Turkish street fare to create a wholly unique hybrid. Did Vahap Usta start the revolution? Did he ride a wave originated elsewhere (at Hamburger University in Oak Brook Ill, perhaps)? 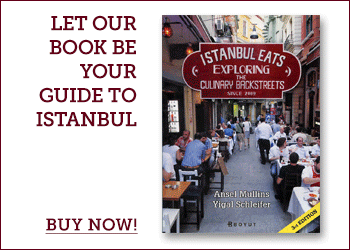 What was the situation of street food in Istanbul, and Istanbul itself, in the 1980s and ’90s that would encourage a man with no experience to declare himself a master of an old trade and model his business on Colonel Sanders? The answers to these questions lie within the story of Vahap Usta. In this series we’ll try to unravel the rise, fall and possible rebirth of this ambitious culinary entrepreneur, the P.T. Barnum of grilled intestines, and see what created the kokoreç king and, beyond that, his kingdom. Şimdi kızımı alıp Şişli ye gitmem icap edecek.